Tis the season for some good grapevine picking — well, in my backyard anyway! This time of year, the wild grapevines are easier to spot and pull away from the trees since the leaves are disappearing. I try to make new a front door wreath each month — to celebrate that month’s main occasion. 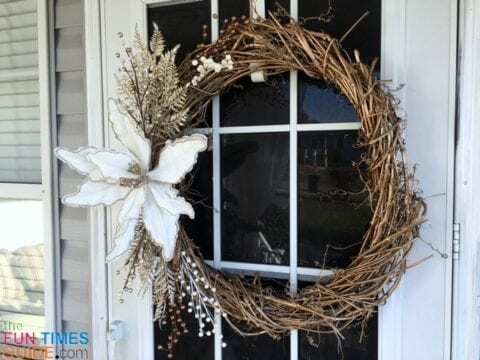 I often choose a mix of natural and artificial materials, according to the theme of the wreath. For most of my front door wreaths, I use the grapevines as a base. 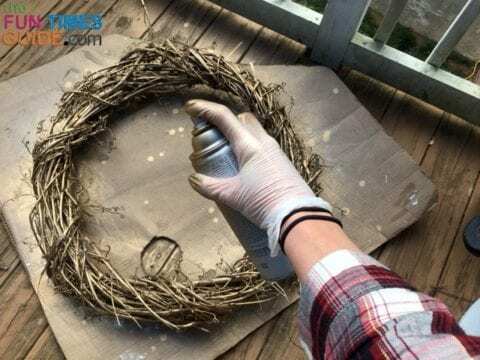 Since the Christmas season is here (and will be over in the blink of an eye), I decided to get a jump start on January’s wreath to hang on New Year’s Day. I was inspired during a recent walk through Hobby Lobby’s individual foliage Christmas aisle. Everything was 50% off — so I decided to get just a couple pieces to finish off the blank grapevine wreath I had already started. I chose a giant white poinsettia, some gold trim, and a few other white & gold accent pieces. I pulled some wild grapevines from our live privacy fence (a giant wall of trees, vines, and shrubs). 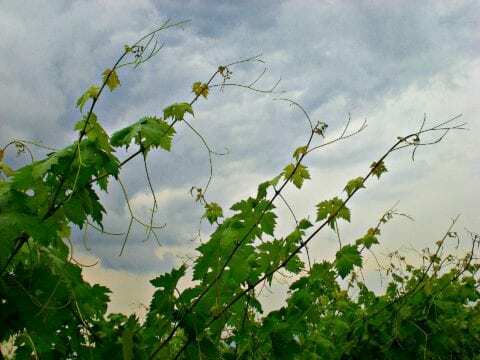 I cut several lengths with my pruning shears and let the vines dry for about a week to allow the leaves to fall off. 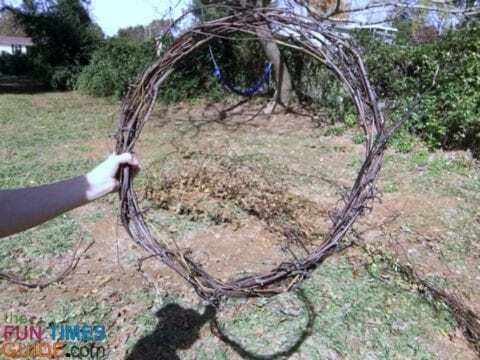 Once the vines were dried, I chose the longest grapevine available and started making a circle in the desired diameter. Once the paint was dry (which doesn’t take very long), I added the large white poinsettia to the left side and positioned the remaining gold & white foliage around it. Once I was happy with the position of the items, I cut the tags and secured the foliage to the wreath using zip ties. 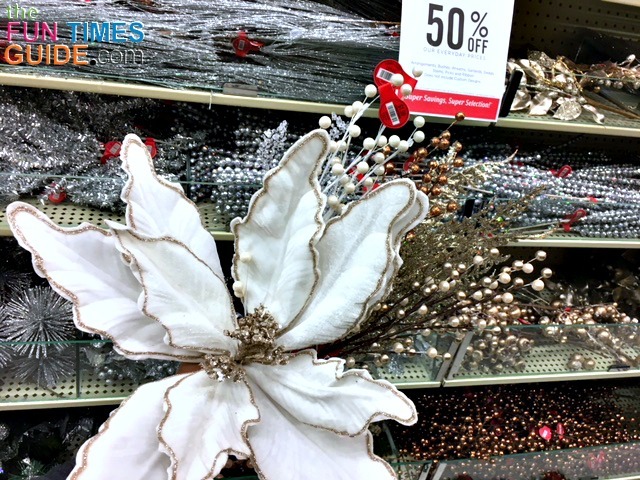 TIP: I like to position the items first before removing any price tags — in case I decide not to use something. That way, I can return any unused items for a full refund. I love the crisp and simple look of this winter wreath! I had some creative fun with this one, and I’ll have a new wreath to hang once all the Christmas decorations come down and the winter blues set in. 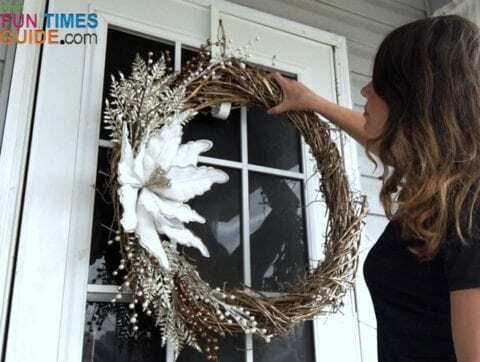 By making my own door wreaths, I can switch up my front door whenever the mood strikes for very little money. I spent about $10 on the Hobby Lobby sale items — which is a great deal when I compare prices of brand new front door wreaths this size. I also find the process quite therapeutic, as I enjoy making new creations. 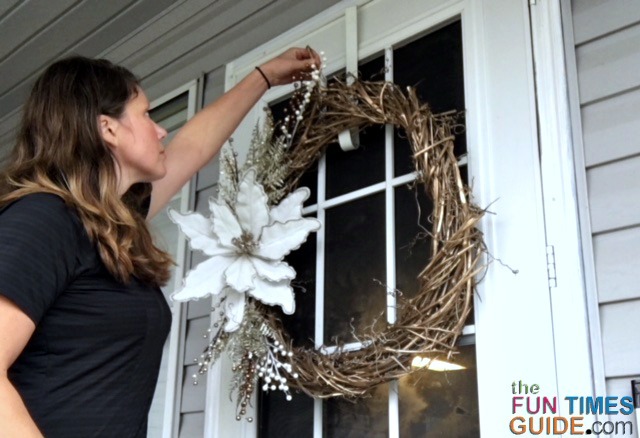 I hope this tutorial is helpful and gives you a little burst of inspiration… Happy wreathing!